New on Google Maps is a virtual tour of deVine’s – check it out. 50 vintages. Francis’ son Marc, a trained oenologist takes care of the Armagnac aging today. 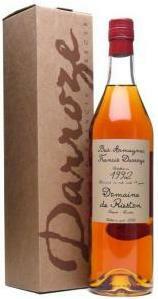 Armagnac area where grapes for the distillation of the Armagnac eau-de-vie can be cultivated. This distinctive brandy is distilled from grapes Colombard, Ugni Blanc and Baco 22A. Volume of production is much smaller than the more famous Cognac region. Armagnac is only distilled once (versus twice in Cognac’s), and is the oldest brandy distilled in France, and in the past was consumed for its therapeutic benefits. While the law required a minimum of ten years of aging in oak barrels, Darroze will wait 15 or more years before releasing. deVine did a special order for the Darroze Collection of single estate and single vintage Bas Armagnacs for your consideration. Most of the vintages we’ve selected are those vintages where wine at a world wide level were not as successful, so as to provide vintage dated spirits for those hard to find birthyears. Very limited availability on these, so grab while supply lasts. Other vintages not linked but available for sale include 1965, 1966, 1967, 1972, 1983, 1999 and 2000.